The echo of the Srebrenica massacre sounds in the hearts of sobbing relatives searching for lost loved ones in a sea of coffins – 465 newly identified victims found in mass graves whose remains will be reburied during Wednesday's anniversary. Some sat crying in the rain beside the thin green coffins. More than 30,000 people came to remember the 1995 wartime killings, the worst mass slaughter in Europe since World War II. They gathered in the Srebrenica suburb of Potocari, where many of the up to 8,000 victims were last seen alive. Serb forces who overran the town on July 11, 1995, separated men and boys from women and executed them over the days that followed. Those men and boys who tried to escape the town over the mountains were hunted and killed if caught. Sehida Abdurahmanovic, 52, came to bury her husband, Jakup, whose remains were found in one of the numerous mass graves around Srebrenica. "My husband and I separated before the soldiers came. I remained with the women and Jakup took our then 20-year-old son up to the mountains to try to get to safety on foot." Only their son, Zijad, survived the journey. "Jakup was identified a year ago," the woman said. "As of today his soul will find peace and I will have a place I can come to and pray." Abdurahmanovic came with her 3-year-old grandson. "We have a new Jakup. We named him after his grandfather. They look alike," she said, passing a shaking hand gently through the child's blond hair. Since early morning, sobbing women mingled among the 465 coffins that were to be buried during the commemoration, searching for their loved ones' names and hugging each other for comfort. During the 1992-95 war, the United Nations declared Srebrenica - which had been besieged by Serb forces throughout the war - a U.N.-protected safe area for civilians but then did nothing to prevent the massacre and expulsion. In July 1995, Bosnian Serb troops led by Gen. Ratko Mladic - now an indicted war crimes suspect - overran the enclave. The outnumbered U.N. troops never fired a shot and could only watch as Mladic's troops rounded up the entire Srebrenica population in the Dutch military compound and took the men away. 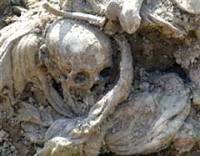 The bodies were dumped into mass graves across the countryside. Thousands are still missing. Mladic and the former Bosnian Serb political leader, Radovan Karadzic - both charged with genocide - are still in hiding. Mladic is believed to be in neighboring Serbia, while Karadzic's whereabouts are unknown. Many survivors feel the U.N. also bears responsibility for the massacre and accuse it of complicity in genocide. In a case brought by Bosnia, the United Nations' highest court ruled earlier this year that Serbia could not be held responsible for the massacre, though the court ruled the killings an act of genocide that Serbia could have prevented. The court also refused Bosnia's request for compensation that could have run into the billions of dollars. Widows of men killed in Srebrenica filed a lawsuit against the Netherlands at a Dutch court this year. Carla del Ponte, the chief prosecutor at the U.N. war crimes tribunal for the former Yugoslavia, attended Wednesday's ceremony. She has been pressing for the arrest of Karadzic and Mladic for years. Every year, more victims' bodies are found in dozens of mass graves around Srebrenica. DNA tests and other forensic methods have led to the identification of over 3,000 victims, including the 465 being buried Wednesday. The memorial center in Potocari is a large graveyard, decorated by huge marble blocks on which the names of victims are engraved. Bare marble blocks stand next to the engraved ones, waiting for new names.